So big changes to the way you embed YouTube videos. Apart from the new look you'll discover that there's no list of size options to choose from. That's because WordPress strips out the size and makes the video full width of whatever screen you're viewing on. It encloses the video in a "fluid width video wrapper". That's geek-speak for responsive. 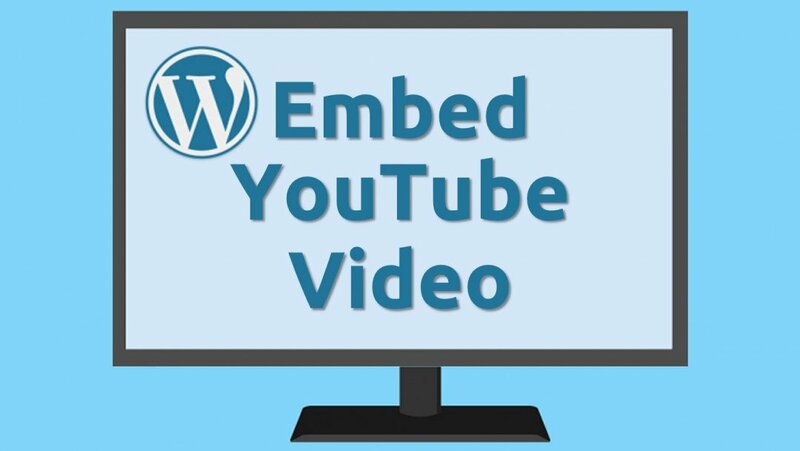 Please watch the video as I walk you through the new way of embedding YouTube videos. Thanks Marion! Great and savvy, most of concise training. This video explained the mystery of why the size of the video appeared to be so huge on my screen -- it's self-adjusting. In some ways I might prefer to make it smaller, for example to appear as more of a small size or a thumbnail size. I don't know what you might think of that. Anyway, cheers! All the best, Marc. Wonderful. You make it so easy. many thanks for the training video. It's a pleasure to share, Andrew. Very good to know. Thank you Marion for always being on top of the latest technology. Well to me it is the latest because I am constantly learning and falling behind. Like you, Ha, I learn something new every day. Good stuff! I saw in other posts that you need to put a "share" button on youtube videos. I don't believe that you included it in your training. Do you know how to do it? Thanks! I'm not quite sure if I'm understanding you correctly, Ian. YouTube adds the share button to the videos. I think I found what I was looking for. We will just have to check the box for "Show video title and player actions". If it's unchecked, it won't show the share button. Thanks! Great training! very helpful... was able to fix my http error and embed my video to my post. Thank you. Thank you Marion, as always, you break lessons down so anyone can understand how to do them. Thank you so much. As always, Marion, really straightforward. You're welcome, Mike, as always. 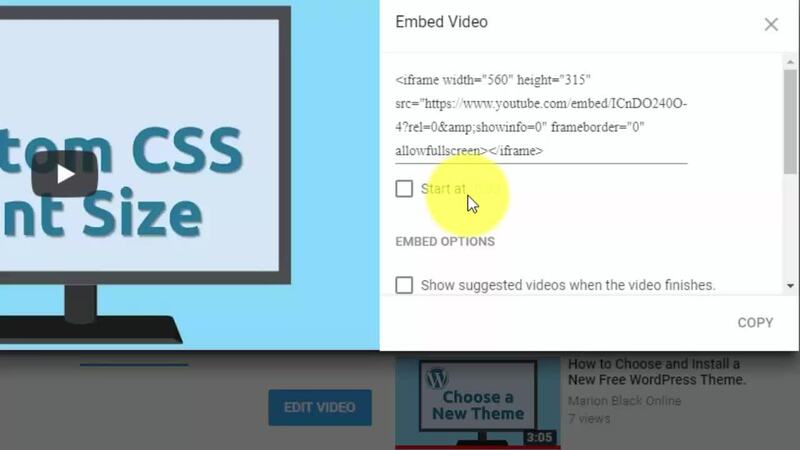 If you want to keep people on your own website then use the embed function and make sure to deselect 'show related videos'. If you want to lose your visitors to YouTube then use the URL link. Thank you, I think I explained it wrong. The way I have been adding the video was getting the URL and posting the actual video on my post (Copy and paste), so they are watching it on the post itself. It is just that I did not do it the way you describe. I am having a problem with my text to media ratio as I have many photos in all of my posts. I am trying to find ways to remedy the situation. I didn't know if the embedded version would use less memory. Thank you again for your guidance, I appreciate it very much! When you just copy and paste you get extra black bars top and bottom and at the end of the video the suggested videos show up. People often click to watch another video and you've lost your visitor to YouTube. I don't understand what you mean by "having a problem with my text to media ratio as I have many photos in all of my posts". What is wrong with having a lot of photos? Some advice you get should be ignored. 3500 words can have lots of pictures and the content should rank well. If you were writing 200 words and had 200 pictures I would be concerned. Try not to over analyze. When it comes to your own website you can do whatever you think is best. Awesome video, extremely helpful. Thanks for taking the time to explain (especially, on using the embed code, instead of share). That is good to know - the upgrade is definitely a good one. I watched your training video from the link you sent to me, you did an awesome job on that training video. I only had one question come to mind, I was wondering will we be able to delete categories and tags from the new editor or still have to do it from our dashboard as we are doing it now? As usual, there's more than one way to accomplish anything in WordPress. You can edit categories from Posts > Categories which will affect all posts using a particular category. And you can edit individual posts. And you can use Quick Edit from Posts > All Posts. I don't think that will change when Gutenberg is released. It would be sweet if you could delete categories and tags right from your posts, I have not really looked for a way to do this but I did not think it was possible. I get a lot of tages built up over time and I have to go to my post tags on my dashboard to delete the ones I am no longer in need of. There's nothing wrong with having a lot of tags. Tags help the search engines understand what your posts and pages are about. I've never deleted a tag ever. Categories are a different matter. I have some tags from when I started my website and changed my niche so they are not relevant to my blog now...............how many tags do you add to a post when you publish a new post........can you have too many tags and categories for the search engines? Tags are relevant to an individual post so they don't affect the rest of your website. Usually, 2 to 5 tags are enough for each post. Marion, thank you for this informative post! Marion, thank you for this essential easy to follow guide on embedding html. I have managed to do it right first time! Thanks again. Excellent. Very simple. Thanks so much. Absolutely. I have lots of videos on my website (and on YouTube). Thank you, Marion. That was a great explanation! Great video. Thanks. I will use this lesson for my websites. You make things easier to follow. Great video on embedding youtube videos Marion, thanks! I needed to revisit this post again today Marion. Excellent! Thank you so very much! this is super helpful! I'm always happy to help Janna. Oh Yay!! Thank you! I've been trying to figure out how to use a couple of videos on my website without having to send my readers away from my page. I wish I could like this video 3 of 4 times. This is so helpful! Thank you, thank you, thank you (for all those 'likes'). Thanks Marion ... very timely. I had just reviewed a much older tutorial on placing and sizing a YouTube video. There used to be a few more HTML Text steps to place and size a video to match the content width. Was it simplified by WordPress updates or Google? WordPress led the way with making videos fill up the available space then YouTube changed their code to suit WordPress and HTML. Thank you for your training to embed a video! Brilliant training! Thank you Marion, I successfully posted a utube video! Ha Ha I did it! I embedded a video in a page! Thank you Marion! Your tutorial is great! It should help you with the terminology. Marion, thank you for sharing. I wasn't sure if you could use the video's on YouTube, but thanks to this post now I know. Thanks again for this information, it is very helpful. Yes, as long as the video is listed publicly it's OK to share. Thank you so so much. I was copying the actual share link & then going back in & putting in a code so it wouldn't show any more videos. This is so much easier. As always, your the best. I'm glad this has made it easier for you. good job marion. Thank you! Thank you for this very helpful training Marion. I was just about to do one so I'm glad I was able to view your training beforehand. Sounds like my timing was spot on. I noticed the size option was removed later, and wondered what I would do IF I wanted to change it. You can change the size by adding some extra code to wrap the iframe into a division. There's a link above under "Related Training". Thanks Marion, is it need now that Wordpress adjusts it? I just plain wouldn't bother doing it. Half the people browsing the internet are using mobile devices so having fixed sizes for anything is counterproductive. Even column widths are expressed in percentages instead of pixel size these days. Thank you, I'll keep doing it the way I have been. Marion, I found this training to be very helpful. Thank You! You say the nicest things Jeff. Awesome training. I have saved it for when I get there. As usual, very good and clear, thank you Marion. Thanks again Marion, for another of your super helpful instructions! Something I have been wanting to do for my own site, you have now shown the way. You're always very welcome Rob. Thanks for the update video. Thanks, Marion, so simple, so easy. Thanks for the up date Marion! i know, it's very close to clicking over into the next level, just needs a shove. It's a bit murky out there sometimes Tracy. Again you have removed a little of The Big Fog. Murky ain't the half of it! That was great Marion. It is good to know that the videos will expand to a bigger size when viewing a website on a desktop and also be responsive to mobile devices. Thanks for sharing, love the training. Marion, thanks for the excellent training. Hi Marion, was wondering if you knew how to add or customize the bullets in word press so they did not have the dots or squares, I saw one site which showed a jet, but they ha no details on how they did it. There's probably a plugin for that. Go to Plugins > Add New and search for bullets or bullet points. Or they may just be using images. I will let you know what I find out, thanks Marion! Hi Marion - Excellent training. I wasn't aware that YouTube had changed the embed process. Thanks for the update. Yeah I used the old method last week and now it's changed. Great training. I like that embedding is preferred over links! Marion, you know the trouble I had with attempting to embed a you tube video in blog posts. I thought I had it before from reading other posts telling how, but this was a huge help/clarification! Thank you! This is perfect!!!! Thank You so much!!!! Thank you very much. tremendous help and easy!!! Glad you liked it Angelica. When I upload a video on YouTube I have 3 choices. The video can be "Public", "Unlisted" or "Private". Public videos can be shared or embedded on other people's websites. When you try to share or embed an Unlisted video a message pops up "This video is unlisted. Be considerate and think twice before sharing." Please don't share or embed unlisted videos. Private videos can only be seen by people who are logged in and have had their email address added to the list of people who are allowed to watch the video. It's OK to share or embed public videos. Many thanks for this information.. Thanks Marion. Very concise and informative. This saved lots of time late at night! Thanks a million. That was very helpful. HI Marion thanks for the great video training. I got it working eventually. I could see the video when in editor visual mode but it wouldn't show when I did preview. All it displayed was a white gap. I eventually worked out that the size I had inserted was too big. Now it is OK. Thanks again for more great training. Glad you got it sorted Alan. Thanks Marion. Also how can I save posts like this to my profile so I have access to it and know where to find it. Thank you very much. A newbie to WA and a learning curve right now. I use the bookmark manager in Chrome and Carson gives us another way A New Spin on Bookmarking your Favorite Stuff at WA! Great tutorial Marion. I use another method, but this helps with re-sizing the video, which I did not know before, thanks. Thank you so much for this Marion, it was exactly what I needed as the videos which I had on my site had been affected by the move to HTTPS!! Glad I could help Chrissie. Most videos on YouTube can be shared. The ones that should not be embedded on your website have warnings when you try to share them. I made use of this tutorial today!!! Steps were easy to follow. Now I have a YouTube video on my blog!!! Just what I was looking for Marion, thank you! More understandable and took much less time. Got it done! Google loves videos so much they own YouTube. great video ! very simple and well explainded thanks ! Just embeded a video in my website as per your instruction. Thank you so much. Thank you Marion. You made that whole process very easy and straight forward. You're awesome! That was an excellent tutorial. Does this mean that the viewer is taken to Youtube from page? Thank you. The viewer sees the video without leaving your website. They have the option to view the video on YouTube if they want to by clicking on the video's bottom right corner. But mostly people will stay on your website to watch. Marion - just perfect! Exactly what I was looking for! Thank you! This video has been really helpful for me. Marion, this is so helpful. Thank you very much! I'm glad I could help Miles. Great video presentation as always. Thanks. I have embedded a video into my website, but once it is there it is not positioned where I would like it. My case in the center. Have you any suggestions how to resolve this? Ms Marion!!!! Thank you sssooo very much for this video!! wonderfully done! Just what I needed. Hi Marion, thank you for making this video. You're welcome John. I'm following you now. Thank you! Really easy to follow and informative. Great job, helped me out quite a bit. Thank you I really appreciate your comments. I just love your videos...I know I have said this a number of times but they are great! WOW! Thank you so very much for this invaluable information. I had been needing to know how to do this. Again thank you very much. Thanks, Marion, you have a wealth of information. You are very welcome Teddy Bear. So to do this I have to upload my video to YouTube. I have my video on my PC in one of my folders. Is there any other way to or direct way to upload it from my PC to my website? Large files slow down your website's loading speed and increase the load on the servers. This would not end up as a good user experience. The safest and easiest way to add video to your site is to upload it to YouTube and then embed it using the process I show above. what screen recording software did you use? Afaizee I am sure marionwill answer you but here is a start. Thanks Marion. it's really useful. Really easy to follow. Irv. I'm always happy to help Irv. Hi Marion, I just followed your instructions on how to embed my youtube video into my website however after I have saved the draft and reviewed I don't see the video. What am I missing? It could be any number of things. Did you use the Text tab? Did you see the outline of the video when you switched to Visual tab? Let me know when you've got it sorted. I did use the text tab to paste the link. On the Visual tab I only saw the grey square of the video but when I did preview there was nothing. I haven't' posted the post yet, it is still a draft. It's got to be something simple. So I'm asking silly questions here. Did you save the draft? What happens if you publish? Can you go through all the steps again to make sure you've got it right. I haven't published it yet; maybe that 's why. I first wanted to finish editing before I publish. I will wait till I publish and see. Thank you! Glad you found it Chris. Thanks Marion, I just embedded my video I've worked on all day! That's great Dave, good to hear. I'll see if this does what I want. Thanks. Yeah, it should fix that issue you were having with the related videos showing at the end. I just implemented it. It did work. I've been fumbling around, understanding only part of the stuff I saw on the Youtube pages and often having to guess away until something worked. I remember previously seeing a notice on Youtube that said Google was no longer allowing the use of webcams to create videos beginning 1-16-2016. I was hot as hell about it but it appears not be accurate. However training tapes that showed you how to create videos with webcams did not match what I saw on the Youtube pages. It just didn't work the way they said. The webcam plus microphone method works but you have to get an approved encoder software program downloaded before you can make it work. Awesome post! Clear, concise, and to the point! Thanks! great post Marion! Thanks really helpful! Best wishes. Hey, hey! Good to see you again. I wanted to ask if I include a video from youtube (which is not mine), should I give give credit to the owner? should I do somethingin the website not to get penalized by Google for using a video from another person? Or I'm not going to get penalized? Thanks for all your input on the community! you are the best. As long as you don't claim the video as your own creation or modify it in any way you can go ahead and embed it in your website. I have one website with around 70 videos from YouTube and only 2 of them were created by me. Thank you so much - very helpful! Keep up all that you do! Many thanks for your awesome training over the past year. All the best for 2016. How do you do this if embedding has been disabled for the video? You don't. If videos don't have the standard YouTube licence (or public domain) then using the video would probably be a breach of copyright. Thought so. I was just confused though because I thought everything on Youtube was free to use. Obviously not! I enjoyed your training about how to embed a YouTube video. Thank you! 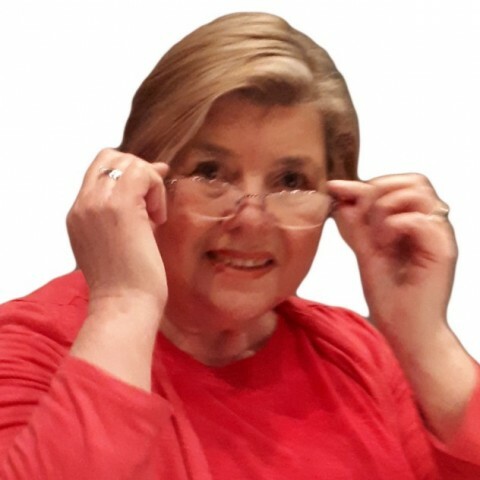 Question for you,...suppose I find a YouTube video and want to share it on my website...how would I know if that YouTube video has a standard YouTube license or public domain license? When you click "Show More" under the video you'll see the licence at the bottom. Thank you for your kind words Valerie. Fab and direct, thanx again Marion! Marion, you teach and show in your trainings in a very simpke and easy to understand format. Now I just need to create some good videos so I can embed them in my website. Good sharing! Are all youtube video available for sharing? how to check on the copyright?